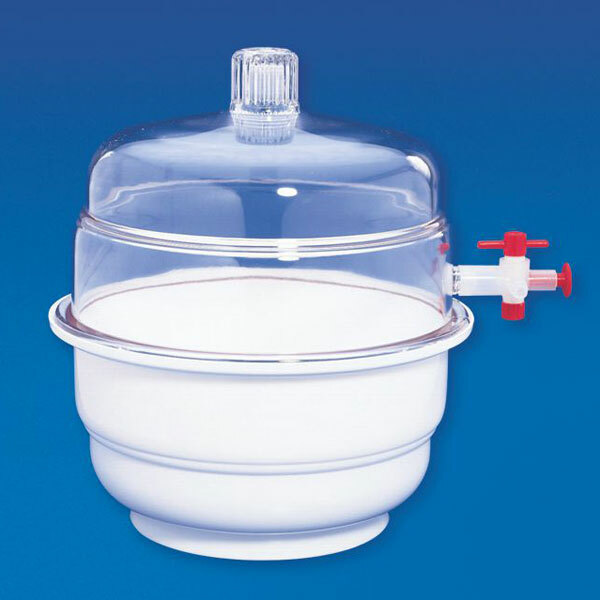 We provide impressive range of Vacuum Laboratory Desiccator. Made of Polypropylene and Polycarbonate, these autoclavable vacuum desiccators can hold Vacuum upto 740 mm of Hg for 24 hrs. The top dome, molded in rigid and transparent Polycarbonate, gives a crystal clear view of the desiccant placed inside. The Knurled knob on the top provides easy handling of the dome. The lower part is made of Polypropylene. An internal groove is provided on the flange to hold a silicon rubber O-ring. The Polypropylene stopcock is fitted with a self lubricating PTFE plug. This plug work three way i.e. Vacuum creation, shutting off & vacuum releasing.